I needed snack. So I made cookies. Crispy and crunchy with chewy raisins that stick in between your teeth. I personally love that. This cookie is not overly sweet, letting the rum soaked raisins stand out. And did i mention that this will turn your house into a cookie land? Oh yeees, cooooooookiee land... say it... come oon, saaay it..
Place raisins in a small bowl and pour in enough spiced rum to cover them. Let them soak overnight. Strain them before adding to the cookie dough. You can also use, whiskey/bourbon, red wine, or fruit juice. The liquid allows the raisins to plump up and gives them a different flavor. Preheat the oven to 375 degrees. In a medium bowl, whisk together the flour, baking soda, salt, and cinnamon. In the bowl of a stand mixer fitted with a paddle attachment, cream together the butter and sugars until light and fluffy. With the mixer still on, add the eggs one at a time. Add the vanilla. With the mixer on low speed, gradually add the dry ingredients. Stop the mixer and scrape down the bowl as needed. Fold in the oatmeal and raisins. Use a large scoop and put rounded mounds of dough onto cookie sheets lined with parchment or foil. Bake in a 374 degree oven for 11-14 minutes, until the edges are slightly browned. Slide the cookies off the cookie sheet as soon as they come out of the oven to cool. I am awesome (?). So I got an award. You can find my 7 facts in this post. One other fact the Mr has noticed is: I'm A-ball-of-contradiction. And for the 15 bloggers, I'll do a 7+1 instead. These are blogs I've recently encountered and they amaze me. 1. Jessica @ She Bakes Here: Because her name is Jessica! I kid I kid... Jessica's desserts really make you think what you can do with your recipes! I mean, you'd think there's only so much muffins (or cookies, ohh her cookies... -drools) until you've seen her website. 3. Kristina @ Spabettie: hee hee. I love the name "Spabettie". -eherm She's very pretty. Gawd, what's wrong with me?! Oh right, her cakes and bars must be making me giddy. 4. Laura @ Laura Loves Cakes: Look, girl, I'm still trying to figure out how to do that Hazelnut caramel whisps thingy! And not to forget how you make everything look so purty!! 5. Antonina @ Dulcegarii culinare: Although I don't understand her posts and Google Translator worsens everything, I look at her pictures as an inspiration.. Just like a plain canvas painted by the artist, her pictures look complete. 7. Yudith @ Blissfully Delicious: Yudith, you are amazing! I would like to thank you for being awesome and for the many many goodies you treat my eyes with. Although it never reaches my palate, but for now, (until technology advances) I'll be satisfied with just watching. Congratulations on receiving this award!! Well deserved :-) These cookies sound delicious. 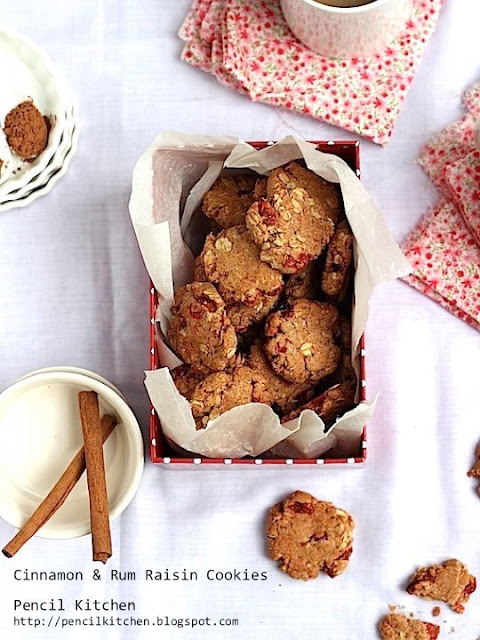 I love raisin cookies and the addition of cinnamon and rum can only make them taste better! @ Eileen: haha! you crack me up, my dear! You crack me up! well, gol! :D aren't you the sweetest? I am honored, seriously. oh, and I want these cookies! @ Kristina: Like tale as old as time, I'd say, you deserve it! No, you deserve a ribena land! Or cadbury island! Congrats on the award, and THANK YOU for passing it along! Thanks also for introducing me to some other great blogs--I wasn't familiar with any of the other ones you mentioned (guess I'm out of the food blogging loop) and I enjoyed checking out everyone else's blogs too. P.S. Cookie Land sounds fabulous and I want to move there immediately. Nom. @ Liz: Oh noooo, that means I'm in the loooop! I know, cookie land is just... mm!m!mm! Rum and raisin in cookie form? Yes please! (and I love the raisins that get stuck in your teeth too, the stickier the better). @ thelittleloaf: I know!! They can stay in between my teeth forever... Well until I start having cavities! I'm moving to Cookie Land too! Buy me a one way ticket! Lovely cookies! I bet they are addictive. @ Rosa: Thank you for visiting back! @ Danijela: I can't believe how it leaves this aroma in the house! Really. Cinnamon, rum, raisin. Your house and maybe a few bed sheets turn to heaven sweetness! I am new here and totally mesmerized by your gorgeous blog and photos. How did I not know you were here? 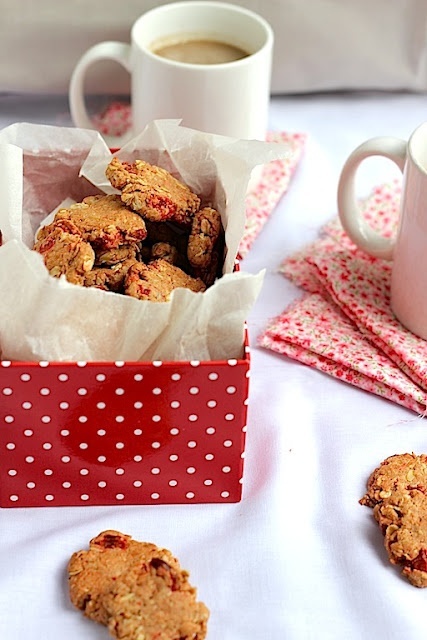 These cookies look scrumptious and I love the fabric you used in the shot. Oh wow!! This looks delicious. However, I have a curse on me..I cannot bake cookies..Everything else works fine but I've never been able to bake a perfect batch of cookies..:( So as much as I wanna try this..I am sceptical about my success..:( :( Its so sad considering how much I love cookies..
@ Curious cook: I know!! Me too! This is actually the first cookie that I succeeded in a long time!!! they're so good!! These look delicious. I love bite-sized crumbly cookies! The rum doesn't hurt either! Yum. @ Gomo: alcohol has long been cooked away but the smell lingers :) Cute name btw! Gomo! I've tried them. They were good, perfect for small after-breakfast treat :) but next time I'll reduce the amount of baking powder and soda.